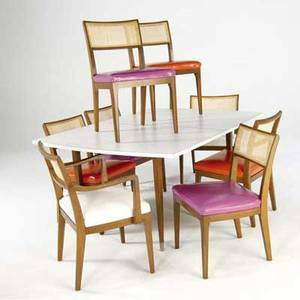 French, 20th century. 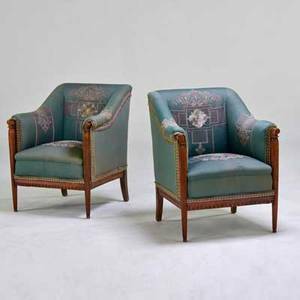 Louis XV style armchairs with caned seats and backs painted in pale blue and with weathered antiqued finish. White painted lattice decoration on caning throughout. 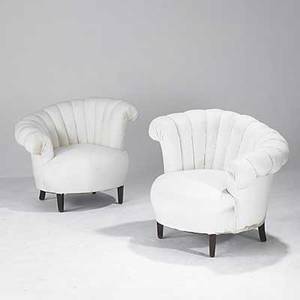 Arm chairs with leaf and scrolled decoration on frame throughout and raised on four cabriole legs with paw feet. Chairs with removable seat cushion with cream and pink thick striped bands on light sage. Height 36", width 26", depth 19". Seat to floor 18". 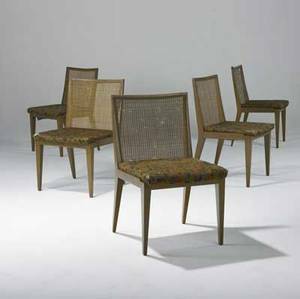 Edward wormley / dunbar group of five dining chairs with caned backs, upholstered seats and walnut frames. dunbar tags. 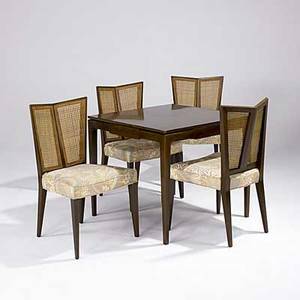 32" x 19" x 20"
Assembled set of 4 Victorian walnut side chairs with upholstered backs and seats. 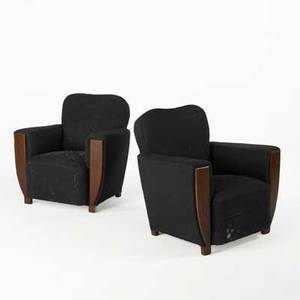 Art deco; pair of upholstered chairs with channel backs, 20th c.; 32" x 37" x 36"
William katavolos / ross littell/ douglas kelley pair of "t" chairs with black leather sling seats on chromed steel frames. 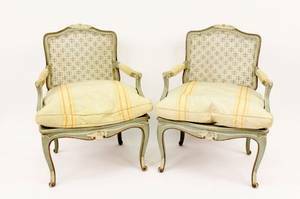 32" x 22 1/2" x 22"
French art deco; pair of club chairs with mahogany trim and feet, in as-found condition, ca. 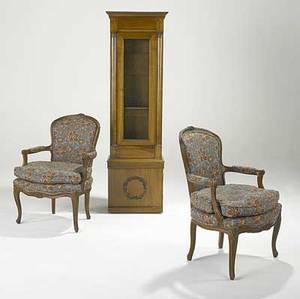 1940; 33" x 34" x 28 1/2"
French furniture pair of bergere chairs with floral upholstery and cabriole legs together with an empire style cabinet. 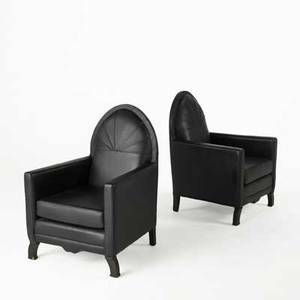 all 20th c. cabinet: 67" x 20" x 12"
Edwardian style; pair of lounge chairs with reed detail and embroidered upholstery; unmarked; 34" x 28" x 29 1/2"
Dutch art deco; pair of club chairs with leather upholstery and rosewood feet, holland, ca. 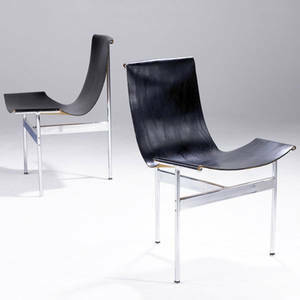 1919; each: 37 1/2" x 26" c 26"